Home > Car Care > When does a CV axle need to be replaced? 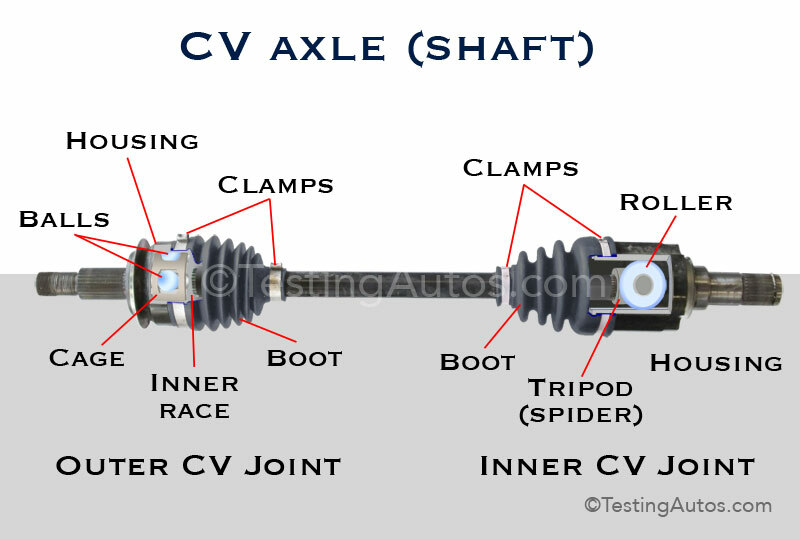 What is a CV axle? 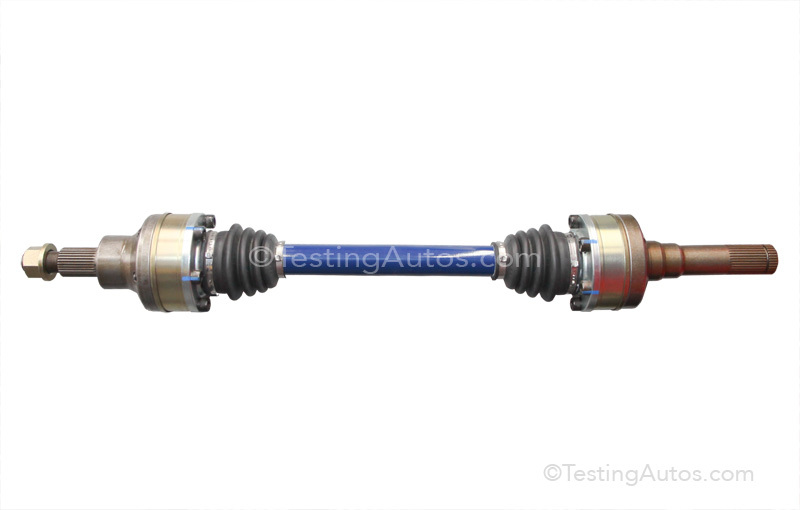 It's a shaft with constant-velocity (CV) joints that transfers the rotating torque to a drive wheel in a car. It might also be called a half shaft or drive shaft. A typical front-wheel drive car has two CV axles (CV shafts), one at each of the front wheels. Rear-wheel drive, all-wheel drive cars SUVs, crossovers and even some pickup trucks have CV axles. CV axles in FWD, AWD and 4WD vehicles. How does a CV axle work? A CV axle is needed when a vehicle has an independent suspension on drive wheels. In an independent suspension, the left and right wheels move up and down following the road surface independently of each other. To transfer the torque to a wheel that is constantly moving and, in case of the front wheels, turning left and right, a CV axle must have joints that can transfer rotating motion under angle. In addition, the length of the shaft must be flexible. Typical CV axle (shaft) of a front wheel drive car with a Rzeppa outer CV joint and closed tripod-style inner joint. rollers on a tripod (spider) that can slide inside the CV joint housing, so the CV axle can extend or contract as needed. The inner CV joint can work under small angle too. The design of outer CV-joint allows it to transfer the rotation motion at greater angles. Both CV joints are packed with grease and sealed with rubber or plastic boots. 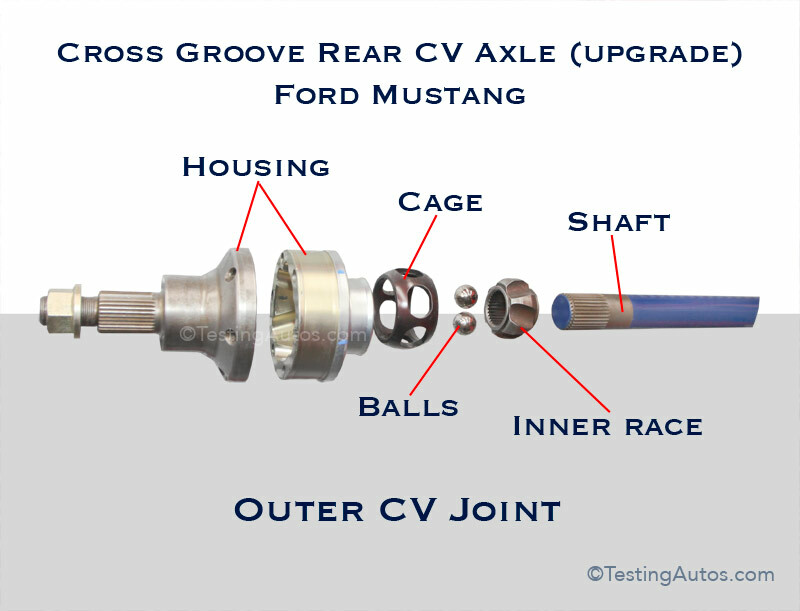 The Rzeppa-type outer CV joint like the one in the image is the most common type. Some rear-wheel drive cars use cross grove joints that look a bit different inside, but work in a similar way. 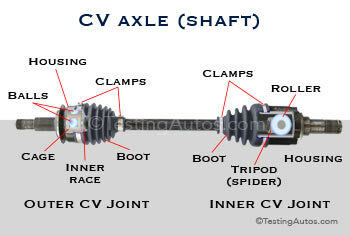 See the diagram of the rear cross-groove CV axle. When does a CV axle need to be replaced? The most common reason to replace a CV axle is when a boot breaks (in the photo), allowing the grease to leak out. Without proper lubrication, a CV joint will not last long. Other reasons to replace a CV axle include excessive wear or damage in an accident or due to rust. In cars and SUVs, with a transversely mounted engine, one of the CV axles is longer (typically the right side), and includes a hanger bearing. If a hanger bearing is worn out or noisy and cannot be replaced separately, the whole CV axle is also replaced. 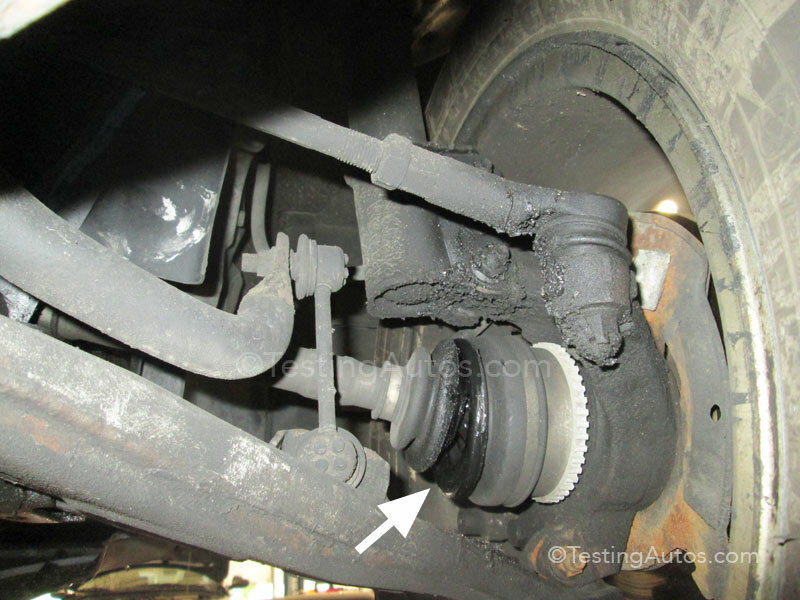 What are the symptoms of a bad CV axle? One of the common symptoms of a bad outer joint is a clicking noise when accelerating in turns. 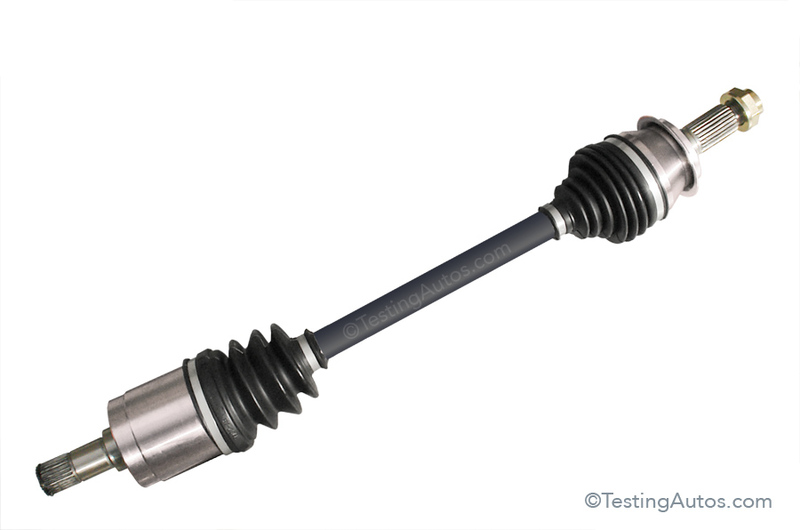 A CV axle the is excessively worn can produce a clunking or clicking noise when shifting between decelerating and accelerating. If an inner joint is worn out or sticking, it can cause the vehicle to shake laterally (side to side) on acceleration. In some cases, a bad CV axle can cause a vibration. or medium front-wheel drive car, replacing one front CV axle with an aftermarket part costs from $180 to $410. OEM parts are more expensive, but the OEM quality is often better. Replacing rear CV axles tend to be more expensive due to extra labor. Can you save a CV axle by replacing only a broken boot? Yes, if you catch it early and the grease hasn't leaked out or water hasn't got in yet, it's one of the possible solutions. It usually comes down to which option is the more cost effective, as well as time and part availability. In some cases, replacing a boot only requires more labor. There are aftermarket boots that can be installed without removing the whole CV axle, but only one side of it. They are called stretch CV boots. The downside is that the quality might not be the same as of the original part. What are the early signs of a broken CV axle boot? If you look at the photo with a broken boot above, you can see the grease splashed all over inside the wheel. Often, you can see the grease spots on the rim from the outside that appear there soon after the boot broke. The good news is that a CV axle in most cars is covered by the powertrain warranty, which is typically 5 years or 60,000 miles. Check your warranty brochure for details.